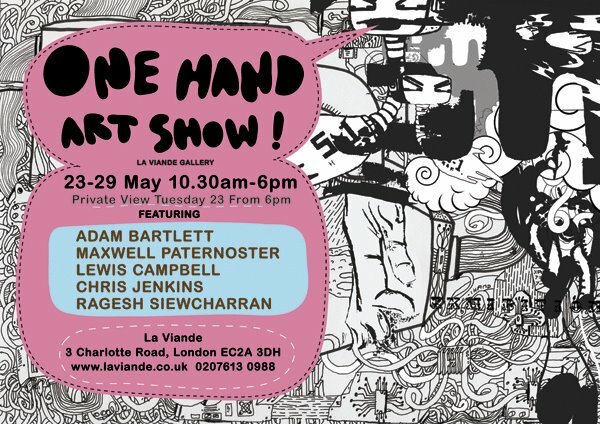 Opening this evening at La viande gallery, a new exhibition titled "One Hand Art Show"
"One Hand" represents the coming together of 5 gifted young artists to create a show which draws it's influences from comics, graffiti, contemporary illustration and sharp edged design. Each artist is unique but all have a common goal- to create something exiting. 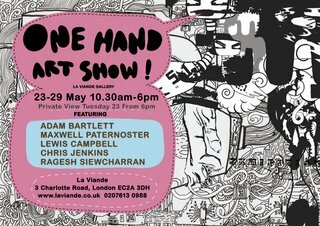 Private view 23rd may, 6pm onwards, with free drink and music all welcome.